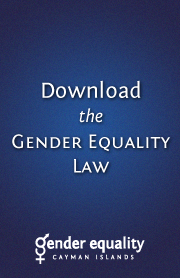 In this section you will find information on specific gender issues and how you can take action and promote gender equality in the Cayman Islands. In addition to the links below, click on any of the links on the right side of the page to learn more about specific gender issues in those areas. 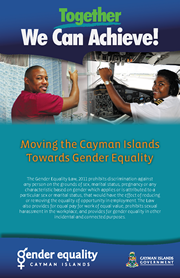 Take this global poll and see what people in the Cayman Islands think about gender equality. The development and production of this national policy by the Cayman Islands Government is a significant milestone towards sustainable human development in our country. This development of this gender policy consisted of highly consultative and participatory methodology and included extensive archival research and historical assessments of gender in the political and social culture of our country. An article on men’s roles in building a feminist future, by Dr Michael Flood, an Australian sociologist at the University of Wollongong and White Ribbon Campaign Ambassador. 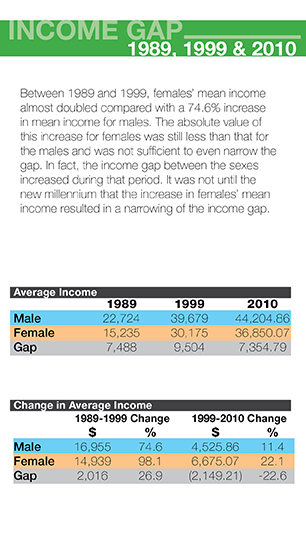 To enact lasting change, men must be involved in challenging the system of inequality. In order to do so, men must become aware of how patriarchy and dominant definitions of masculinity limit them. Sociologist Todd Migliaccio calls for changing interactions and focusing on attaining egalitarian relationships with everyone. The intention is, impact the world in front of you, and then hope the rest will follow. Geena Davis on how gender inequality on TV and in movies has a powerful impact on kids. After extracting data from the 2010 Population and Housing Census, the Ministry of Community Affairs, Gender and Housing, the Economics and Statistics Office and Government Information Services have created an informational brochure that illustrates their findings. 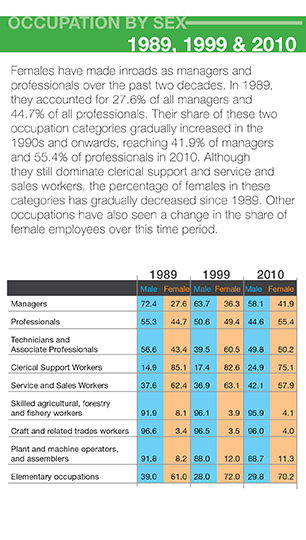 Comparative data on the gender gaps in income and various occupations are also available utilising census data from 1989, 1999 and 2010. The founding United Nations charter (1945) included a provision for equality between men and women. Subsequently, from 1945 to 1975 various female officials within the United Nations and leaders of women's movements on the global stage attempted to turn these principles into action. The Fourth World Conference on Women: Action for Equality, Development and Peace was the name given for a conference convened by the United Nations 4-15 September 1995 in Beijing, China, which resulted in the Beijing Declaration and Platform for Action to advance the goals of equality, development and peace for all women everywhere in the interest of all humanity. See the Cayman Islands Government Submission for the 2015 Review here. This is the main page for the World Bank's research and policies on gender equality that promote closing gender gaps as a way to foster economic growth and decrease poverty. This UNDP note focuses on the instrumental case for investing in gender equality to improve human development and achieve the Millennium Development Goals. Trinidad has the highest rating the Caribbean for gender equality, according to data from the United Nations Development Programme’s 2011 report. Trinidad has an index of 0.331, which is 53rd in the world. 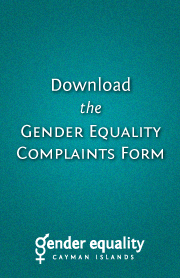 A tool for promoting equality in your workplace. CML TV presents the first in the "Thought Leaders" series featuring exclusive interviews with industry leaders in the Cayman Islands: The Cayman Islands Gender Equality Bill 2011 featuring Associate Nicholas Dunne from Walkers' Employment Group. Deloitte Public Sector's research "Paths to Power: Advancing women in government" spotlights personal stories and insights of senior women around the world and explores the growing impact and importance of women in senior, decision-making roles in government.